Hailed by its creators as a recipe for a new form of consensus politics in Thailand and criticised by others for diluting democracy, the verdict on the proposed new Thai constitution or charter, will ultimately be delivered by the Thai people in an August ballot. 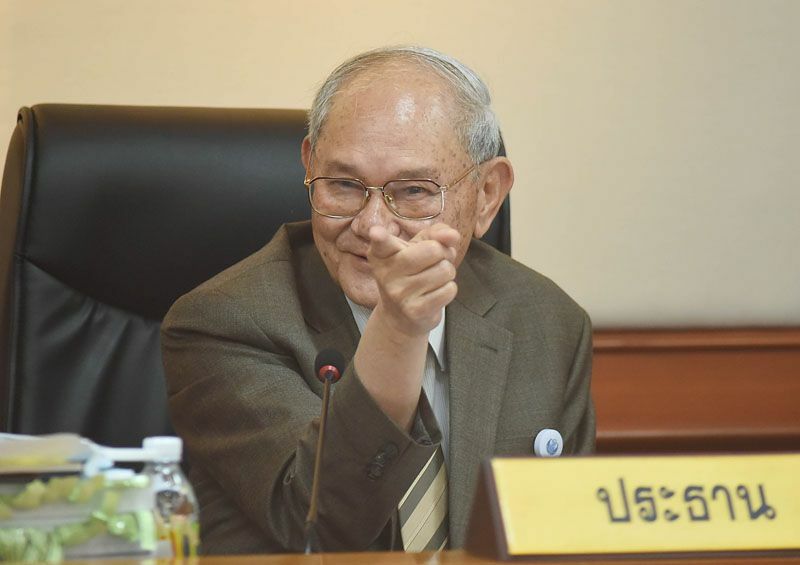 On Tuesday the 29th of March the Constitutional Drafting Committee, through its Chairman Meechai Ruchuphan, presented a draft charter or proposed constitution for Thailand. It to be voted on by the Thai public in early August 2016. The proposed charter or draft constitution is now the subject of a controlled debate leading to the referendum on August 7th. It is clear, from an initial reading, that it is radically different to previous incarnations. One key thrust of overarching law seems to be a desire to limit the power of populism. It unashamedly introduces enhanced oversight of any government arising from the electoral process. In a written introduction, the new constitution references past political crises. It attributes such crises to the failure of those involved in government to respect ‘rules governing the country’. The stated aim of the charter is to create an environment which reduces political conflict in Thailand. The overarching goal is to produce a society that is ‘happy and peaceful’. The charter identifies the key principle for this outcome as being ‘love and unity’. The charter itself contains 279 articles and is 105 pages long. It is clear from the provisions of the charter that there is to be an extended role for the National Council for Peace and Order. This is the military junta holding power in Thailand since 2014. The charter outlines how the power of government will be transferred from the junta to a newly formed government under provisions in articles 262 to 279. Under its key provisions, Thailand will have 500 MPs elected to a lower house of parliament. This chamber will be initially responsible for electing a Prime Minister. The initial candidates for the post of Prime Minister will come from the party lists under the party list system. A similar system is also used in Germany. An upper house or senate of 250 members will have considerable powers of oversight. The power of the upper house will also extend to choosing a Prime Minister where MPs in the lower house fail to find majority support for a particular candidate. In this event, the charter proposes that a joint session of both houses be held in order to select a new leader of the government. Provisions are also made in the charter for the nomination and election of a Prime Minister who is not a sitting MP. One of the key provisions of the new charter is Article 269. This provides that for the first five years, after an election in Thailand, the upper house or senate will effectively be chosen by the National Council for Peace and Order or the military junta. Under Article 244, members of the Senate will be chosen by a selection committee appointed by the NCPO. The other six members will be ex officio positions to be filled by the commanders of the armed forces as well as the army commander and chief and the senior civil servant from the Defence Ministry. Under Article 270 of the charter, the upper house has extensive powers to endorse laws and monitor the effectiveness of ongoing reforms. Under this provision, the government and cabinet will be required to report to the senate on a three monthly basis and inform it on how these reforms are being carried out. The provision goes further and allows for the senate to intervene if it judges the reforms are not being carried out in a timely manner. After any election, there will follow the process for selecting a Prime Minister. Article 265 of the proposed charter specifies that the National Council for Peace and Order will remain as the main government authority until a newly formed government and cabinet comes to power. Significantly, Article 279 provides that all orders and actions by the National Council for Peace and Order and the leaders of the military junta before the new constitution comes into force will themselves be considered constitutional and will have the power of law. Although ultimately for the judiciary to decide, this may make it extremely difficult for anyone attempting to challenge any past actions or orders of the military junta in the future if the the charter is adopted. It is still unclear how the Thai people will vote on the referendum to endorse the new charter in August. But it must be noted that opinion polls in Thailand seem to consistently support the efforts of the military administration. Polls have also shown a certain amount of confusion and lack of knowledge about the proposed new charter. A series of controlled TV debates is being organised by Thailand’s electoral commission. The Pheu Thai party, which was the governing political party prior to the 2014 coup, has indicated some opposition to the new constitution. On March 30th, the day after the charter was announced, the party appeared to call for the rejection of the proposed new constitution for Thailand. In a written statement, it said that the proposed constitution was a violation of democratic principles. In the strongly worded bulletin, the party claimed that the charter would result in a weak and unstable government, not capable of bringing about development in Thailand. It particularly criticised what it called the ‘unprecedented power’ given to the Thai constitutional court. Under the new charter, the constitutional court has the power to impeach MPs, senators and even the entire cabinet. However since then, there have been voices within the party urging a less confrontational stance while others remain in opposition. One leading Pheu Thai party opponent, Chawalit Wichayasuit, has suggested that he expects voter turnout for the referendum to be very high. It should be noted that there are certainly elements within the Pheu Thai party who are not so sure about advising the public to reject the charter. It is reported that the Deputy Leader of Pheu Thai, Jurin Laksanawisit, is to undertake a survey of the party before a final decision is made. Similarly Abhisit Vejjajiva, leader of the Democrat party and former Prime Minister will not announce that party’s stance on the charter until later in April. ‘Our ultimate goal is for the country to move forward with a sustainable democracy,’ Mr Vejjajiva said. On a personal basis, the Eton educated Democratic Party leader, was more negative about the charter. He suggested that it was a step back for Thailand in terms of its provisions diluting the democratic process. Mr Vejjajiva’s concerns centred on the charter’s deficiencies when it comes to democratic principles, human rights and personal liberties. The new charter seems to have taken many politicians and observers somewhat off guard by its radical nature. It contains concrete proposals, which it is claimed, will root out corruption at government level. But this is also the source of criticism from opponents within the Pheu Thai party. The party identifies more power being transferred to unelected officials working for the government as a negative move. They are also critical of the emphasis in the new charter on twenty year national strategies. The Pheu Thai party believes this would prevent future elected governments in Thailand from steering the country in a different direction and would stifle the ability to create development and growth. There has also been criticism from some educational activists. They have focused on some provisions which seem to indicate less government commitment to education at secondary level including government funding for later stages of education at secondary level. 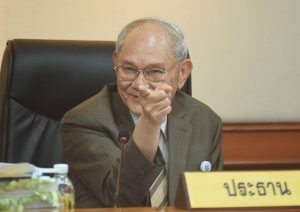 Mr Meechai, in comments to the media pointed out that the junta appointed senate would only serve in an advisory capacity and would only be called into action in the event of problems arising within the lower house. He made a similar observation with the provisions provided for on the charter in relation to an unelected Prime Minister. ‘We have included an avenue,’ he said, referring to the provision allowing for an unelected Prime Minister. ‘If there is no reason to use this clause then it won’t be used, it would be up to the elected MPs.’ A significant point to note is that while parliament must find a majority to approve an unelected Prime Minister from outside membership of the lower house, the appointment of such a Prime Minister must be subsequently approved by a joint session of the lower house and the appointed senate. While increasing the strength of small political parties and reducing the ability of one party to dominate the political arena, it is also apparent that the new constitution is designed to strengthen the powers of unelected institutions in Thailand and indeed the military, for the foreseeable future. Speaking to the AFP news agency, Paul Chambers, an academic in Thailand, described the result of the charter as a ‘frail democracy’. It is a charter which expands military and judicial power at the expense of democracy,’ he told the international media organisation. The current Prime Minister and leader of the National Council for Peace and Order has refused to state categorically what the plans for the military junta are in the event of the rejection of the charter and has instead focused on getting the measure accepted.